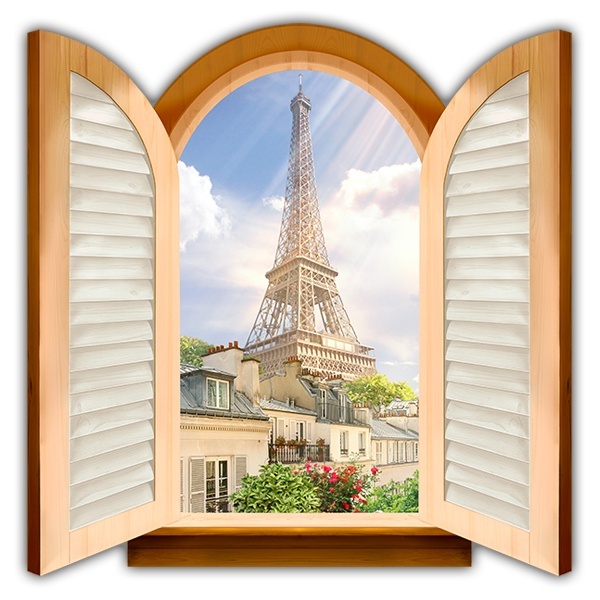 Window wall sticker Eiffel Tower. Trompe-l'oeil of an old window overlooking the Eiffel Tower. Image of the iconic Tower of Paris located on the banks of the river Seine. Built for the Expo of 1889 is a symbol of France. 19.69 x 20.08 in. 23.62 x 24.02 in. 27.56 x 27.95 in. 31.50 x 31.89 in. 35.43 x 35.83 in. 39.37 x 39.76 in. 43.31 x 43.70 in. 47.24 x 48.03 in. 51.18 x 51.97 in.